Hi. My name is Ian Peakes. I’m playing the role of Dale in the current production of Something Intangible and I wanted to talk about revisiting a play. Something that is kind of remarkable in this business. Remarkable because it’s completely and utterly different every time you amass a new ensemble to attack the same material. But this situation is slightly unique. And really quite exciting. As actors, we often do a show more than once. Often performing different roles in each production. But I have never been a part of a play quite so intimately. 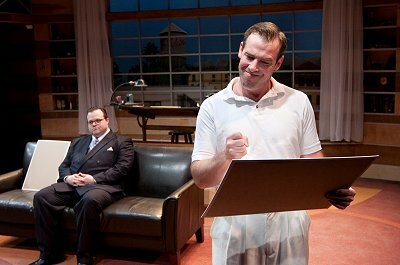 In 2009, I was part of the world premiere of Something Intangible at the Arden Theatre in Philadelphia and I played the other brother then, Tony, now being wonderfully portrayed by Mr Shawn Fagan. One night out after a preview in Philadelphia, the writer Bruce Graham, told me and the actor then playing Dale (Scott Greer, seen last season here in Art and God of Carnage) that he wrote the play for us. I was totally gobsmacked! I tell you this only to let you know how much I was Tony. It was me. And now it is not. Crazy! 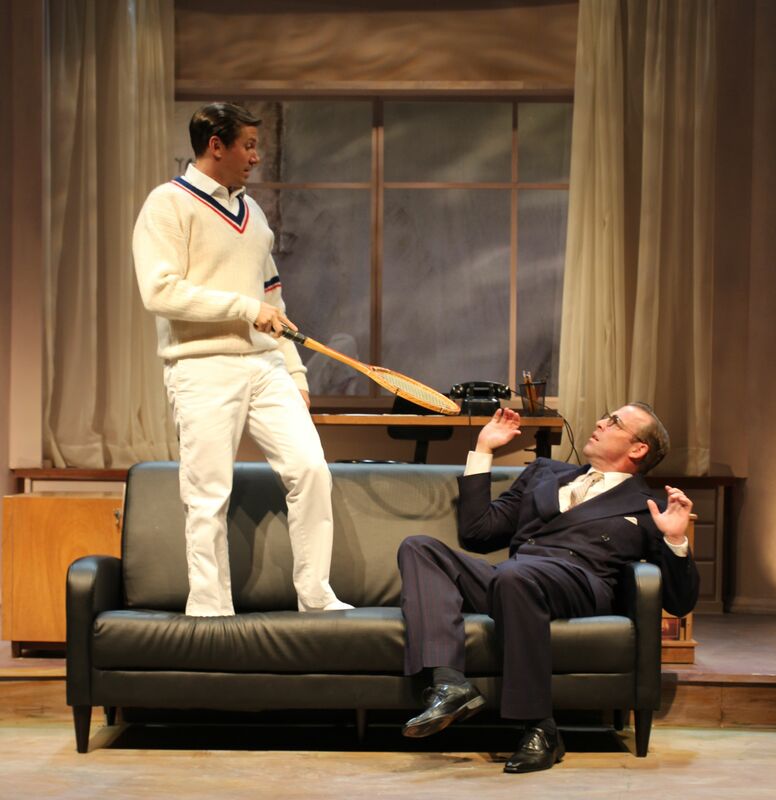 I have done other plays more than once, playing other roles, but nothing quite as intense as this. Being part of the first production of this beautiful play meant helping form it at it’s very moment of creation. It meant trying to help figure out the playing of the play as a whole AND figuring out my character. The creation of a brand new character in a brand new play can sometimes be pretty insular in that it can become all one is consumed with. You spend so much time trying to figure out the play and then you need to bring this dude to life. And that becomes your driving thought. How does this guy breathe with other people? What matters to him? How does he serve the play? Which has been really interesting for me now, playing the other brother. How does HE breathe with other people? So much of the play has opened up to me playing Dale. Things that did not concern Tony. The relationship with Sonia. The stillness and watching. The entire character of Danny, my characters’ never seen but often talked of son, has been a huge part of that. Often playwrights use the device of a never seen but often mentioned character. I have never experienced a better use of this device than Danny in this play. He is so real and palpable. I have fallen madly in love with this fictional child. Tony, as the play tells us, has little interest in this child. When I played that part before, and was invested in the telling of his story, I was not concerned with that aspect. Specifically because the playwright indicates he is not. It was not my job. So I was oblivious to the connection that was there. So what a great surprise to find that there was a new friend (Danny) to be had in a play I knew so well. It’s also amazing to understand the difference of when it is time to tell a story and when it is time to bring in the funk. I tell the story now. Shawn brings the energy. And as an actor who never wants to stop learning it’s invaluable to know your place in a tale. How to serve the play. Which, at the end of the day, is our only job. Both are immensely important and thrilling and exhausting. And we were very lucky to have Cody Nickell at the helm of this awesome journey. I ramble. It’s what I do. Hope this makes some sense. I love my job.